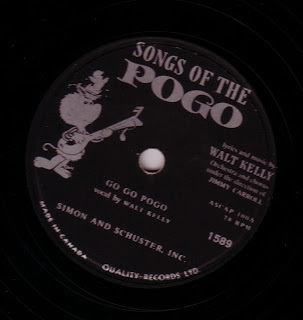 A friend gave me an old 78 (he had two copies) featuring 3 songs from the 1956 album Songs of the Pogo; Don't Sugar Me, Lines Upon a Tranquil Brow, and Go Go Pogo. Don't Sugar Me has vocal by Fia Karin, the others by himself, Walt Kelly. I go goo goo goin' go go Pogo! good news for folks is that the songs are available on CD and MP3s, wherever CDs and MP3s can be found.